For years I have been posting about Family Research Council President Tony Perkins and his ties to various White Supremacist Organizations. 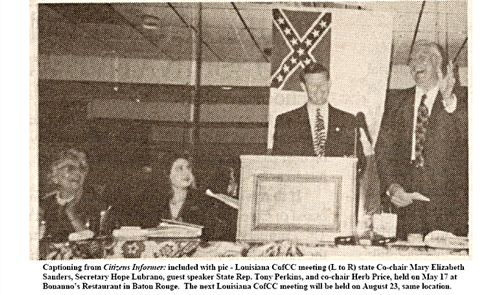 Back in 2001 then Louisiana state Rep. Perkins addressed and received an award from the Council Of Conservative Citizens, an SPLC certified racist hate group with active chapters in more than a dozen states including South Carolina. Now this weekend we learn that another follower of the CCC is Charleston mass murderer Dylann Roof. Perkins’ speech to the CCC (formerly the White Citizens Council) came only five years after he was fined by the Federal Elections Commission for lying about an $82k payment to Ku Klux Klan Grand Wizard David Duke. The Council Of Conservative Citizens has either crashed or been taking offline at the time of this posting but its Headlines section is still available and very disturbing.